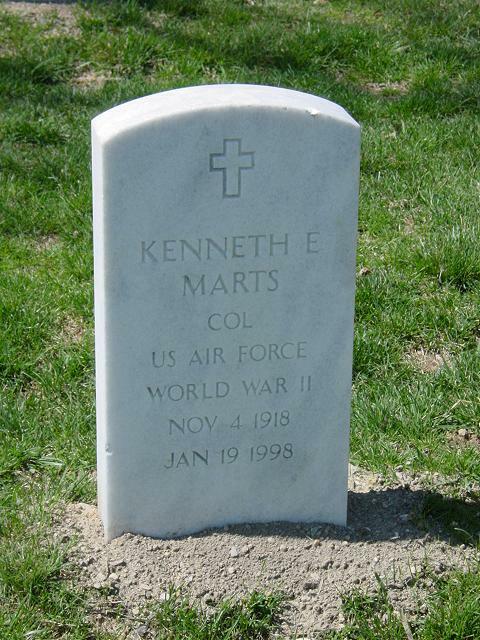 Kenneth Elliot Marts, 79, a retired Air Force colonel who later operated a wedding photography business in Camp Springs, died of kidney failure January 19,1998 at Potomac Valley Nursing and Wellness Center in Rockville, Maryland. Colonel Marts began his military career during World War II, serving as a pilot of B-17 aircraft in the Army Air Forces. He was based in England and participated in bombing missions over Germany. Postwar assignments included command of a B-47 wing with the Strategic Air Command, chief of staff at Torrejon Air Force Base in Madrid and study at the Air Force Command and Staff School and the Air War College. He retired from the Air Force in 1965 as deputy chief of personnel of the Air Force Systems Command at Andrews Air Force Base. His decorations included a Legion of Merit and the Air Medal. Colonel Marts, a resident of Camp Springs for more than 30 years, was born in Wichita and graduated from the University of Wichita. His avocations included music and art, and he worked in acrylics and oils. His wife, Blanche Olive McGlade Marts, died last month. Survivors include four children, Eric Alan Marts, Kristina Lockhart, Dan Thomas Marts and Curtis Luckner Marts ; his mother, Billie Mae Marts; a sister; and four grandchildren. On Monday, December 29, 1997, BLANCHE OLIVE MARTS, of Camp Springs, MD, beloved wife of Kenneth E. Marts; mother of Eric, Dan and Curtis Marts and Kristina Lockhart; grandmother of Christopher, Bradley, Alexa and Christa; sister of Lucile DeWaide and Merle Almond. Funeral service to be held on Friday, January 9 at 3 p.m. at Ft. Myer Chapel, Fort Myer, Arlington, VA. Interment Arlington National Cemetery.